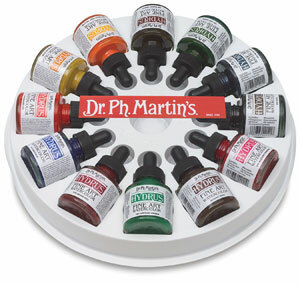 Used in technical, calligraphy, fountain pens and airbrushes. Fine art quality watercolor in a bottle. Same brilliance and permanency as traditional tube watercolors. Can be blended and intermixed. 12-color sets. ® Dr. Ph. Martin's is a registered trademark.® Hydrus is a registered trademark.